Longmorn is a Speyside distillery most of whose output goes into Pernod Ricard’s blends. At least I assume it does as so litle is released as single malts by the distillery: there is an official 16 year old bottling (which replaced an earlier 15 yo) but that’s pretty much it. Most whisky geeks are puzzled by the owners’ seeming lack of interest in Longmorn as a single malt producer as its whisky–widely available as single malts from independent bottlers–is of uniformly high quality. Its principal quality is its soft mellow mouthfeel and a wonderful fruitiness, which manifests itself as bright summery fruit when young (especially when coming out of bourbon casks) and can exhibit wonderful and deep tropical and fermented notes once it gets to the 30 yo mark (and comes out of refill sherry casks). The Longmorn I am tasting tonight was released by Duncan Taylor in 2003 as part of their now-defunct Whisky Galore line. Whisky Galore bottlings were generally affordable, and the few I have tried have all been quite good. This line has since been replaced by the NC2 line. The label does not specify but this is quite clearly from a bourbon cask, and given the lack of pronounced vanilla notes probably a refill cask. Nose: Bright, mildly acidic fruit: tart apples, maybe pears. Sweaty, malty notes (more pleasant than it sounds). Citrus notes come to the fore with time, some sweetness too: pound cake with lemon essence and lemon zest? Palate: Exactly as promised by the nose, though more apple peels than fruit perhaps at first, and the citrus comes on a lot faster; and a little more astringency from the wood and a little more acidity in general. Finish: Long, with expanding lemon zest and finally tingling wood spice. Comments: Not complex at all, but highly pleasurable. A perfect light whisky for a summer night or as an aperitif; or perhaps even to accompany a fruity dessert. Wish I’d bought a second. I prefer this to the over-priced official 16 yo; not by much, but this was almost half the price. My somewhat large pour tonight was from the very end of the bottle (after reserving a large reference sample for purposes of future comparisons) but I can’t say the character of this malt changed very much at all over the life of the bottle. 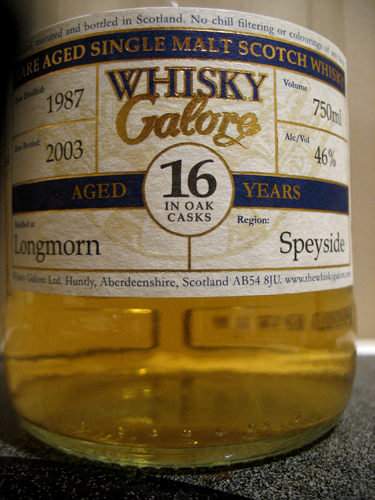 This entry was posted in -Whisky by Rating, 85-89 points, Duncan Taylor, Longmorn, Whisky by Bottler. Bookmark the permalink.